The struggle to make ends meet and survive in any economic crisis is sadly a universal theme of the past, present, and future. What gets us through the hardship is the real story. In Clifford Odets classic Awake and Sing, the Berger family attempts to live together in harmony while barely making ends meet. The play is a staple in the classic American play canon, so reviving it takes great care. In NuAnce Theatre's immersive production, the Berger household is literally recreated allowing you to be a fly on the wall as Berger and friends attempt to maintain life. What makes this production of Awake and Sing special is the atmosphere. Though not a site-specific production, this version transports the Berger apartment and drops it right into the black box studio. With a concept by John DeSotelle and scenic designer Brian McManimon, the tenement-style apartment that the Bergers may have actually lived in is recreated, skeleton walls and all, with the audience sitting all around it. The spirit of the time and class was present in grand fashion. Attention to detail was paid which is appreciated. 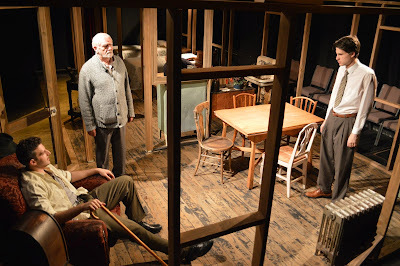 On stage, the set truly captured the definitive no-escape feeling of Odets’ play. With so many bodies with very few places to be alone, the scenic concept worked wonders. The voyeuristic idea also allowed the audience to find new discoveries within the script, something a generic production may not allow you to do. With an extremely ambitious scenic design, let's be real, you may not be able to see everything from your vantage point. Having to poke your head around corners is not necessarily ideal for an audience, especially in a three-act play. The nuances in the various rooms may have been lost in certain seating sections. Perhaps if the set was pushed to the far wall and the audience was set up more in a proscenium or two sided setting, all would not be lost. With the set being a newfound character, the ensemble had a new set of challenges to physically overcome. As a whole, each actor seemed to tap into a singular emotion of their respective character and play that the whole way through. Margo Singaliese as Bessie brought an always overwhelmed and overworked victim to the matriarch. Michael Citriniti as Myron played up the lackadaisical elements of the father. Spencer Carter as Ralph offered a very youthful performance, seemingly heightened and whiney at all times. Charles Dinstuhl as Jacob filled the room with wisdom. Bobby Kruger as tenant Moe Axelrod seemed to evoke an element of defeat within Moe at the start with the subtext of “I told you so” that translated into great strength by Act III. Director John DeSotelle took great care and time into developing his concept for the play. While this was significantly important, it fell a bit short in his staging. As inevitable with a three-quarter set up, some audience members may lose action dependent on their placement in the theater. Despite knowing the script, there were some key moments that were completely lost due to actor blocking. While DeSotelle did do his best in minimizing this, it inevitably happened. Costume designer Jude Hinojosa blended the classic period into the costumes quite well. With the nice light versus shadow design by lighting designer Brian McManimon, the atmosphere of the time was present. Sound designer Annie R. Such created a wonderful musical and ambiance soundscape but it was quite difficult to establish the difference between door buzzer and phone ring. For a small revival, NuAnce Theatre’s Awake and Sing was quite grand. There were flaws but overall it was a strong revival. John DeSotelle’s vision was clear and perhaps with a little more work on the acting side, this production could be something special.